Some 400 British companies have taken part in the 100 Days of Carbon Clean-up challenge, for which they looked at ways to reduce their greenhouse gas emissions. 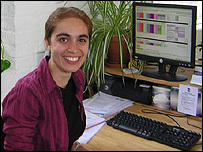 One of the small businesses involved, Fulcrum Consulting, kept a diary of its progress for the BBC News website. Our 100 days are up, and we reached our target! During the past 100 days we have found ways to reduce our annual emissions by the volume of carbon that would fill our office building. We have calculated total annual savings of just over 6.5 tonnes CO2. Our success came with our final electricity meter readings. We ran a comparison of these against readings taken for the same period last year and showed a saving of 3.6 tonnes of CO2 (a 30% reduction). Minus the savings we have already accounted for, this gave us an extra 2.5 tonnes towards out target. 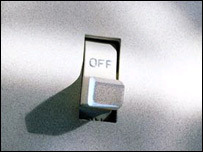 We can attribute this saving to our diligence with turning off lights, fans, monitors etc when we are not using them. 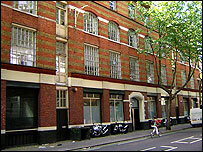 As a naturally ventilated office with no air conditioning or lifts, we started from a reasonably carbon-virtuous position. We calculated that if we had "best practice" energy efficient air conditioning installed then our carbon emissions would increase by 4.4 tonnes CO2 a year. There were several initiatives which proved impossible to quantify in terms of carbon savings. These include recycling. The volumes and variety of waste that we recycle have (from observation) increased dramatically. We have not yet had our figures back from London Recycling or completed our "after" waste audit, but we are confident that these will demonstrate a marked change. We know that there are significant environmental benefits to recycling materials as opposed to sending them to land-fill, but were unable to find any way of quantifying these benefits in terms of carbon saved per recycled volume, so we cannot include this in our total. Purchasing changes will also have significant environmental benefits (even if we can't quantify them) - using recycled toilet rolls, ecological cleaning products and fair trade tea and coffee will all help in different ways. We are also in the process of switching our electricity contract over to a provider of "green" electricity. However, this won't happen until our present contract runs out in November and so couldn't be included in our totals either. The results of our BREEAM assessment for the building (see entry for 24th July) show that we currently achieve a rating of "Good". We have already identified and had management approval for a number of measures which should enable us to reach a rating of "Very Good" by the end of the year and "Excellent" by the end of 2008. These include writing and instigating an environmental policy, improving our existing environmental purchasing policy, achieving ISO14001 (the environmental management standard) status, committing to regular energy audits and targeting reductions in CO2 emissions for the future. This is exciting as it enables us to take the work we've done on our 100 days campaign forward and provides a tangible way of tracking our progress. We are proud of the changes we have made to our company in 100 days and are keen that it won't stop here. We have shifted our purchasing and disposal habits as an organisation and taken steps to reduce wastage and cut our energy bills. These are intended as permanent changes and we are setting targets to further reduce our environmental impact over the coming years. With two weeks to go until the end of our 100 days we are feeling the pressure to get everything done in time. Although we have made significant progress, we have not yet achieved our target of saving as much carbon dioxide as would fill our building. We are currently at 7.5m up the building and we need to reach 12m. Our quest for water savings has floundered a bit. Although we have now received a load of hippos, which are blocks that reduce the amount of water needed to fill a cistern, from Thames Water, it transpires that all of our office toilet cisterns are six litres and the hippos only work in older nine-litre cisterns. We have, however, made the surplus hippos available to staff to take and use at home. Our office water consumption is not enormous at approximately four cubic metres per person per year, so there may not be a great deal we can do to bring this down. We are still investigating our night time meter readings. I have an assurance from our IT manager that the server room will be monitored this week, but we have also been touring the building looking for stray appliances. We found a couple of extractor fans that were left on high for no apparent reason, and some electrical items that are very rarely used that were plugged in and consuming power. We also found some instructions for our combination gas boilers on the internet and checked the settings. We discovered that the heating on the second floor had been left on the other morning, and it turned out that all three boilers had not been put into summer mode (hot water only), meaning that the heating was therefore coming on if the temperature in the office dipped low enough. This was partly due to the counter-intuitive icons on the switch. 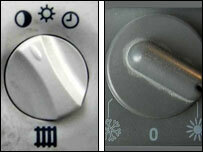 One boiler manufacturer uses a sun for the summer setting and another manufacturer uses a similar image for the winter setting. We have stuck the instructions up on each boiler for future reference. On each floor, we have a Digital Imaging Device (DID) which we use for all our printing, photocopying and scanning. We have been experimenting with the power save options, hoping to optimise them and see a reduction in their average power consumption. We monitored the DIDs in each mode and mysteriously they only used one watt less in power save mode (87 watts) than in normal standby (88 watt), and a whopping one kilowatt as they "woke up" from this mode, which made the overall power consumption higher. In the "sleep" mode the power used goes down to 25W, but with three machines, it is still costing us £40 a year to run these machines for evenings and weekends when there is no one in the office to use them. We are going to investigate putting time switches on the plugs for each device to automatically turn them off at the wall between 2100-0700 and at weekends. I am informed that once they have gone into sleep mode they will not be adversely affected by having the power pulled on them. It seems a shame that such sophisticated machines need such a low tech solution to save power. Although we only got 31 responses in the end, we have compiled the results of our 'Edge Pledge' carbon audit of staff households. The results vary from 18.3 to 2.1 tonnes of CO2 per adult per year; the highest coming from a colleague living alone, driving a car and a motorbike and flying regularly. The lowest came from someone who shared a house with four other adults and rode a bicycle to work. We compiled a chart to show the breakdown of carbon emissions for the average Fulcrum employee. It is interesting to note that three-quarters of the energy use is from transport, including nearly half from flights. We have been calculating the carbon savings associated with our 100 days initiatives to update our "Building-o-Meter". 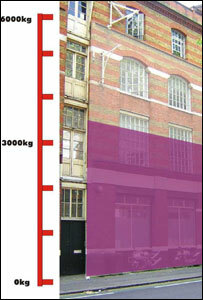 The results show that the carbon we have saved would fill the building to 7.5m, equivalent to nearly two whole floors. The most impressive of these is the carbon savings from switching to recycled copier paper. According to the US Environmental Protection Agency (EPA) "Producing recycled paper requires about 60% of the energy used to make paper from virgin wood pulp". We used figures from their website and found that switching our huge annual paper purchases (approximately 350 reams, which is 175,000 sheets - information courtesy of receptionist Danielle) to recycled paper saved more than 2,300kg of CO2 a year. This result was so large that we checked it three times. There were concerns that the change in paper would affect our copiers and cause more jamming etc, but there have been no reported problems at all. It has also been satisfying to discover that the white paper we send to be recycled is processed and returned to us as paper ready to start the cycle again. Tessa's diligence at taking meter readings every Monday morning has yielded a chart which shows our electricity consumption is creeping downwards slowly. It is good to have some evidence that our 100 days campaign is starting to make a difference. 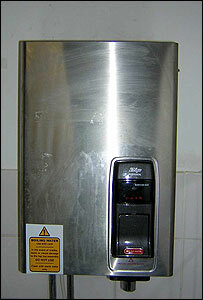 Water week is still pending as the hippos requested from Thames Water three weeks ago have yet to materialise. We are hoping to get enough to fit some in the older, larger cisterns in the office and still have some to hand out to any staff who want to use them at home. Another matter puzzling us is Andrew's discovery that his Whirlpool washing machine uses 0.63 kWh to perform a standard 40°C wash, exactly the same amount of energy to do the same wash using its "powersave" setting. He has promised to dig out the manual to see if that sheds any light on the function of this option. We're too hot! Productivity in the office has slumped as the heat wave has kicked in. Our usually light and airy Victorian warehouse building is unable to keep out the exceptionally high temperatures, and our eco-principles are threatened as we all start to covet air conditioning. We are doing our best under the circumstances. Ice cream consumption has increased, the water coolers are very busy and even the male employees have started to show a bit of leg and toe, but when the temperature at my desk reached 33C last week it was hard not to pack up and go home. With respect to our 100 days campaign, the recycling seems to be progressing, although we have had a small hiccup as we negotiate with the cleaners for them to empty all the new blue recycling bins into the big wheelie in reception. We have also moved ahead with our information campaign to make it clear what can and what can't go in the mixed recycling containers. Despite this there have still been sightings of items such as crisp packets, plastic bags and a kettle found in the blue bins. Our nighttime zero project has progressed with Tessa taking meter readings morning and evening to track how our consumption during the day compares with that at night. The electricity readings show the most surprising results with our night time power consumption (per hour) approximately 60% of the day time consumption. We are aware of certain power uses at night, such as the servers which carry out nightly back-ups and batch processing at night, we also have dishwashers that get set off every evening, but are struggling to justify why we are using so much power when we are not here. We are hoping that the 100 days campaign will help to reduce this by ensuring we don't leave lights and fans on at night and that the printers/copiers all turn them selves off. We hope to do some break-downs to explain this power consumption and hopefully reduce it. 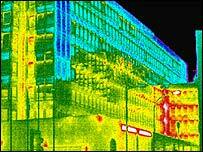 Our next initiative is to carry out a BREEAM assessment on the office. The BREEAM scheme is run by the BRE (Building Research Establishment) and is their Environmental Assessment Method. 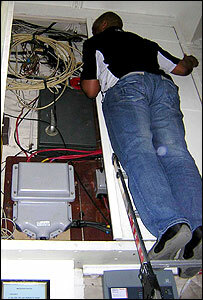 We will do a Management and Operation assessment which is designed to be used on existing, occupied offices. The method looks at many aspects of sustainability and provides an overall rating from Pass to Excellent which allows comparison with other buildings. Fulcrum have several licensed BREEAM assessors in house, and whilst we are unlikely to go as far as getting the assessment formally certified, we are hoping that the report might be informative for our management and landlord, and may lead on to future improvements. Recycling week got off to a slow start because the blue bins we had ordered were delayed and the core 100 days project team had a busy work week. We decided to postpone the launch by a week. So, today we have posted recycling information on our intranet, distributed the blue bins and are watching as they slowly fill with white paper. This does not represent progress, as white paper is the one item not supposed to go in these bins (we have white sacks for it). Last week, Tessa conducted an audit where she emptied every waste bin in the office and separated it into types: white paper, mixed paper, cans and bottles, organic and non-recyclable. She then took pictures and we made a pie chart. We estimated that over 60% of the contents of our bins could have been recycled (based on volume). We strongly believe that the key is awareness. For example, I did not know that our recycling contract includes toner cartridges and juice cartons, so how would the rest of the staff? We are putting information on the intranet, putting up posters, and London Recycling have supplied us with stickers that we have attached to all the new blue bins outlining what can go in them. We also need to get John the cleaner on board with collecting the blue bin contents and looking out for recyclables in the wrong bins. We hope to do a similar audit at the end of the 100 days and find a 50% reduction in the amount we throw away. We are still thinking about how we can roughly quantify the carbon savings associated with increasing our recycling rates - suggestions welcome. We have issued our "Building-O-Meter" graphic to display progress towards our target of saving enough carbon to fill the volume of our building (6000 kg of CO2). The calculated savings so far have only taken us up to the window sill on the ground floor, but much of our work is in progress, and the savings being made not calculated yet. Updates will follow. This week we are focusing our efforts on trying to increase the amount of waste we recycle. Tessa and I met today with a representative (Lauren) from London Recycling who collects the recycling from our office. They take white paper in sacks and empty a large blue wheelie bin of mixed recycling (glass, cans, cardboard, plastic etc). She did an audit on what was contained in our maxi-waste bin, and established that we are recycling magazines and cardboard, but very little else. A quick check in our reception waste bin revealed drink cans, envelopes and junk mail, all of which could be recycled. The same was true when we did a quick survey around the office at the end of the day. So there's an exciting amount of potential for improvement! Figures for the last three years show that we generally recycle about 750kg of white paper a year, and at a rough estimate we throw out 6,500kg of refuse. It would be great to make a dramatic change to these figures. Our mixed waste recycling contract only started in March this year, but we have arranged to monitor this through the 100 days. On Monday we will be starting an awareness campaign to make sure all staff understand what our recycling provision is and to help make it as easy as possible to recycle as much as possible. London Recycling have promised to provide a range of posters and stickers to highlight what we can recycle and also information about what happens to our waste once they've collected it. They have also offered a lunch time seminar which we will try to fit in next week. We have placed an order for 10 new blue bins to collect recyclables from around the office. We hope that reducing the distance people have to go to dispose of recyclables will increase uptake. If that doesn't work we will be looking for ways to embarrass those found with recyclables in their rubbish bins. Tessa has done some analysis based on last year's meter readings and information provided by the Chartered Institute of Building Services Engineers (CIBSE), which established that our electricity and gas consumption falls well short of even typical practice, let alone best practice for office buildings. Whilst the age of our building goes some way to explain this, these figures confirm that we must try harder! This week we are launching the first of our carbon saving strategies, having now established benchmarks to measure progress against. 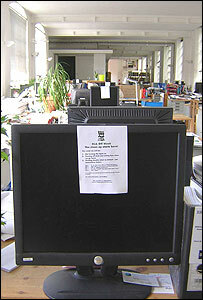 We have printed out flyers (4 to an A4 page) and have attached one to every PC screen this morning. We decided that this investment in paper was worthwhile as the information disseminated through our internal intranet is not having sufficient impact. The flyer includes instructions on how to change printer default settings to double sided. Our receptionist, Danielle, is responsible for our paper purchasing and has promised to keep track of how much we order over the 100 days. 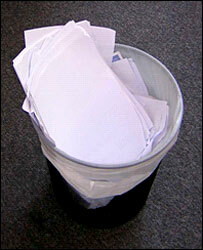 We estimate that we currently get though 750 sheets of A4 paper a day. Will we able to make a noticeable difference to this? Work has proceeded to work out how much carbon dioxide we could fit within our London HQ office. 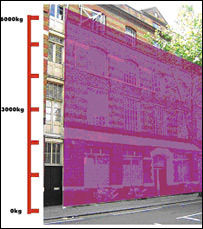 Calculations show that the volume of the three-storey building is approximately 2,900 cubic metres. Carbon dioxide has a volume - at standard room temperature - of approximately half a cubic metre per kg. Therefore it would take 5,800 kg of CO2 to fill up the building. We are setting this as our target for the 100 days campaign, and are working on a "building-o-meter" graphic to illustrate our progress towards this target. The energy meters purchased last week have been a great success. We now know that our standard PCs use 70 watts, and our flat-screen monitors 20 watts when they are switched on. A much larger study covering more of our electrical equipment is being carried out by our "carbon monitors". This will include monitoring equipment when it is on standby to find out which things are worth making an effort to turn off completely at night. Results from monitoring one of our boiling water dispensers demonstrated that we could save 40% by turning it off for evenings and weekends. Tessa has sourced a seven-day time switch which can do this automatically and still have the water up to temperature by the time the first cup of tea is required in the morning. At a cost of £4.99, this has a pay back period of less than 4 months. With four of these boilers in the building, potential annual carbon savings could reach the window sill on the ground floor! Andy Ford took a monitor home and discovered that a phone charger uses three watts when it is not being used but is still plugged in a socket. This means that in one year, it can waste as much energy as leaving a fan heater on for a whole day. Next week we are going to turn our attention to recycling. Week two of our 100 days of carbon clean-up and enthusiasm is still running high. CAD (Computer Aided Design) man Martin has been roped in to help read the meters every Monday morning. We have also discovered a new electricity meter to add to our collection. Work continues to identify the areas served by each meter. We have purchased three "plug-in mains power and energy monitors" so we can monitor the energy consumed by various appliances. We are kicking off with Tessa's PC, monitor and a desk fan. We have also bought a device called an "electrisave" that clips on to an electricity meter and gives you a continuous read out of power consumption, CO2 emissions and cost. We took advantage of the large invited audience for our Fulcrum Sustainability Debate on Thursday evening to announce our involvement in the 100 days campaign. The debate entitled: "This forum believes that all pre-2000 buildings should be overclad by 2050" was very lively. The overall conclusion was overcladding would improve thermal insulation and reduce heating requirements, and that this would be a step in the right direction, but would only form a small part of the giant leap required to solve our climate change problems. There has been some debate regarding how much time should be spent on our efforts to reduce emissions, reflecting the issues faced by many companies when balancing upfront investment of time and resources against long term emission reductions and related cost savings. It was decided that all ideas would be allocated a time budget, and prioritised according to their importance to the project and their potential carbon savings. The team envisages spending some time getting the project up and running during the first few weeks and then another burst of energy collecting and disseminating results, with a lull during the middle of the project where efforts are made only to keep all our initiatives on track. Many of the initiatives, such as increasing our recycling rates, turning off lights and appliances, will be done on a voluntary basis with no cost implications. I myself had a bash at water saving (and therefore saving the CO2 emissions from its treatment and transportation) by siphoning our used bath water out of the bathroom window to water all the flower pots in the back yard - a remarkably easy process. I am still wondering whether utilising the bath water in this way mitigates the environmental effects of not taking showers instead, but it did make watering the flowers quicker during the hosepipe ban. Fulcrum is an engineering consultancy famous for innovation in low-energy and sustainable buildings - however we don't generally get as much time as we'd like to focus our minds on our own carbon emissions! The 100 days campaign is a great incentive for us to do this. We kicked off with a meeting to discuss plans for reducing our emissions as much as possible within the project timescale. As part of this, we've planned weekly meetings on Tuesday afternoons for the core 100 days team (Susie, Tessa, Tom, Andrew, Chani and Andy F). We have allocated the first 10 days for benchmark-setting, idea-gathering and dissemination of information. A key part of our strategy is getting everyone in the company engaged, and we have set up an e-mail address for staff to send in their ideas. We've also set up a competition to decide a company reward incentive, with the reward budget equal to the price of a year's worth of savings. Our company intranet will keep people involved throughout the campaign. The first thing we plan to do is establish our benchmarks (i.e. our starting point). Once we know our base consumption levels we'll be able to measure our success more accurately. We have been taking monthly meter readings for gas, electricity and water to calculate our annual consumption. This data is not quite as complete as it might be due to the challenges involved with remembering to take monthly readings from meters which are not all easily accessible (chairs and torches are required!). We have also had problems identifying which meters serve which areas of our three floors of Victorian warehouse building. Another aspect of our benchmark gathering is to persuade each employee to complete a simple spreadsheet (the "Edge Pledge") to work out their annual carbon emissions due to travel and domestic use. This has proved harder than anticipated, as most people don't seem to have much idea what their annual energy bills are at home, or what the fuel consumption is for their vehicle - or maybe they are just too busy working to take the time to think about this! Only nine out of about 60 possible responses so far. We're trying to come up with a suitable incentive to encourage more people to fill it in. One of the proposals from today's meeting was to measure the amount of carbon we save during the 100 days in relation to the volume of our office building. We need to do some calculations so that we can calibrate this appropriately. We've come up with quite a few ideas for initiatives that we want to have a go at during the campaign. We have also created a logo to tie all our initiatives together. Cutting food-miles travelled by the office "daily fruit"
Company Director, Andy F, is going to inaugurate our 100 days campaign at the Fulcrum Sustainability Debate on Thursday evening. The title of the debate is "This forum believes that all pre-2000 buildings should be overclad by 2050".